Sun Panel Sculpture, Earth Sculpture, and the Tower. The language of nature is the language of people. Each kind of life (form) also has a (technical) function. 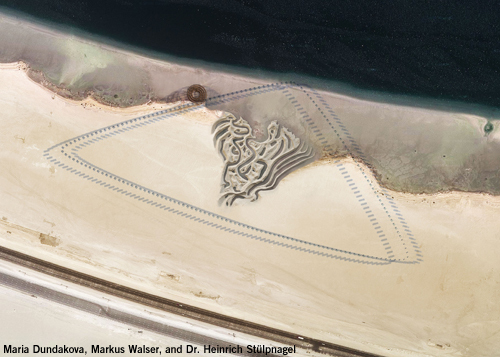 The topography of Abu Dhabi is formed by the gravitational rhythm of the tide’s ebb and flow. Natural space and urban space are interconnected in a unique choreography of the elements earth, water, sun and air. In Sun Rite Gravitation, a choreography of the tides emerges from the arabesque movements of the Earth Sculpture. 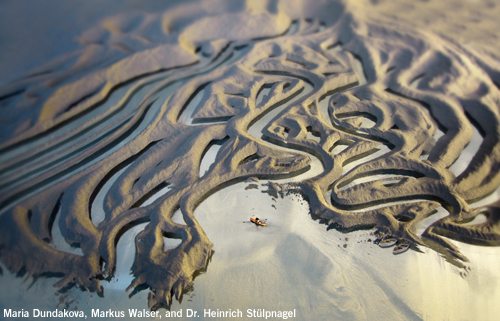 Water channels that mark the Earth’s surface offer habitats for countless living species. Small, raised, dune-like formations provide a natural environment for green vegetation. 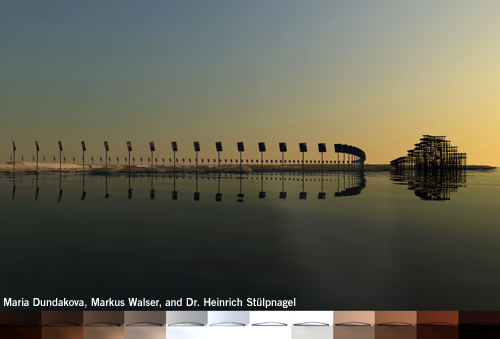 Among the elements that coexist with the natural tidal arena, the surrounding sun panels constitute a triangle that visually connects water and Earth. The sun panels rotate like sunflowers, tracking the sun. Each individual element is just a piece of technology, but arranging them in a sequence creates a constantly changing line in the landscape that traces the horizon. A mirror on the back of each panel reflects the landscape, thus creating a dialogue between the sky and the Earth. The installation changes all the time, taking on a different aspect 365 days of the year. A spiral-shaped tower connects sky and Earth and provides an opportunity for visitors to observe the entire surrounding landscape in all directions from above. The chaos aesthetic of the macro and micro life elements and the juxtaposed new urban aesthetic of the sun panels have a mutually heightening effect. Three dialogue spheres, three sculptures, interact within a triangular topography.